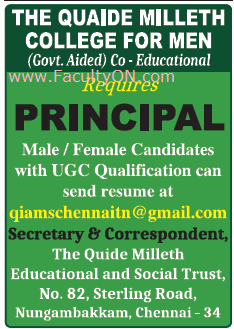 The Quaide Milleth College for Men Chennai has advertised for recruitment of Principal jobs vacancies. Interested and eligible job aspirants are requested to apply immediately from 02nd December 2018. Check out further more details below. About College: The words Quaide Milleth mean Guide of the people and leader of the community. Quaide Milleth Alhaj Muhammed Ismail Sahib was born in 1896 at Pettai, Tirunelveli, bloomed on the horizon of Tamil Nadu public life and the fragrance of his service blossomed across the whole India, even crossing India. Ismail Sahib was ignited into Indias freedom struggle by Mahatma Gandhi. He shared the political stage with stalwarts like Shri. Rajagopalachari and Dr. C.N. Annadurai. He was an exemplary legislator for many years. He was an activist in Khilafath Movement. His participation in the fund mobilization for Jamia Millia by Dr. Zakir Hussain exemplified his magnanimity. How to Apply: Interested and eligible candidates are requested to send application with detailed resume along with copies of certificates and PP size photos to the email address mentioned below.